Gaels at the University of Glasgow in the seventeenth century. Gaels could be found attending the University of Glasgow throughout the seventeenth century. Although they were always a minority, almost every year group of matriculating students or graduates contains recognisably Gaelic names. The daoine uaisle or upper castes of clan society were one of the two most visible groups at the University, the other group being those who were training for the ministry and usually sponsored by the Synod of Argyll. One of the noble families who can be identified as sending their children to be educated in Glasgow were the MacDougalls of Dunollie. This was a family that employed Gaelic scribes in the early seventeenth century. A fragment of a Gaelic contract of lease survives, written sometime between 1603 and 1616 for Donnchadh MacDougall of Dunollie. One of the physicians in the area, Iain MacConacher (Eoin Ó Conchubair), wrote a short account in Gaelic marking the death of Donnchadh of Dunollie in August 1616. Donnchadh was followed as chief by Iain Macdougall, who may have been one and the same as the ‘Joannes McDowgall’ who attended classes at the University of Glasgow in 1598. ‘Allexander McDougall primogenitus domini de Donollyche’ as he signed the University roll, 1629. Reproduced here by kind permission of the University of Glasgow Archive Services, University collection, GB0248 GUA 26619/192. While MacDougall may have had most of his education in other languages he also took a strong interest in classical Gaelic. A manuscript bearing the pedigree of Alexander or Alasdair Mòr, this chief of the Macdougalls (and presumably paid for by MacDougall) was written out in Gaelic, according to Ronald Black, sometime between 1625 and 1650 by a scribe proficient in classical Gaelic, Eoghan MacPháill. The manuscript, ‘Senchus Cloinne Dubhail’, survives in the National Library of Scotland (NLS, Adv MS, 72.1.9). Image, reproduced, below, by kind permission of the National Library of Scotland, NLS, Adv MS. 72.1.9, fol 1r. 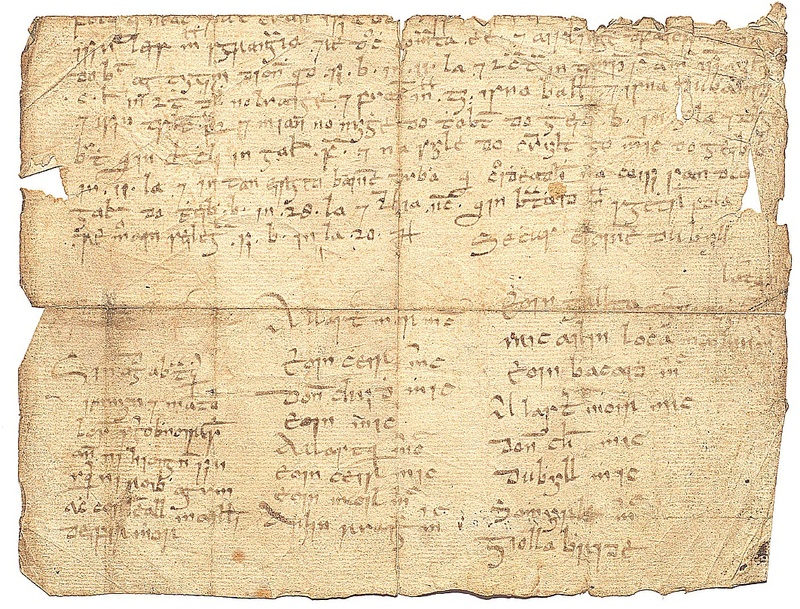 The two columns on the bottom right of the document show the descent of ‘Allast[air] mor m[a]c Eòin Cèir’, of the seventeenth century all the way back to the eponymous Dùbhghall (Dougall) and Dùbhghall’s father, the celebrated 12th century Gaelic warlord, Somhairle mac Gillebride. MacIain of Ardnamurchan and Lachlann Mackinnon of Strath, in Skye, drew up a legal document in 1619 at Glasgow. One of the witnesses who signed this deed was a kinsman, Niall Mackinnon, student at Glasgow University. Niall went on to be minister at Kilchrist in Strath. A cousin of Niall was a student at Glasgow at the same time. This was an Iain Mackinnon (MA 1620) who went on to become minister in Bracadale and Minginish in Skye. Another, slightly older contemporary, minister in Skye, Uisdean MacSween (MA 1597), had also been educated at Glasgow and was minister at Duirinish in Skye around the same time. Some members of the Clan Macdonald of Sleat can be seen attending the University of Glasgow around the same time. The University was on a fundraising drive, hoping to improve the fabric of their buildings. A large number of clergymen and nobles throughout the kingdom donated monies during the 1630s. Some of these donors were from the Gaidhealtachd. This list included Sir Dòmhnall Gorm Òg, chief of the Macdonalds of Sleat gave a grant to the University of £100 to help with the costs of building a new library in 1633. Sir Dòmhnall sent his son Seumas to the University of Glasgow the following year. This was Sir Seumas Macdonald, chief of the Macdonalds of Sleat, 1643-78. Sir Seumas, like many of his contemporaries, supported and encouraged Gaelic poetry. The (in)famous poet, Iain Lom Macdonald, Bard of Keppoch, composed a praise poem around 1664 in honour of Sir Seumas, ‘Iorram do Bhàta MhicDhòmhnaill’ (an oar song for Macdonald’s galley). Iain Lom also composed an elegy for Sir Seumas on his death in 1678. Another Gaelic poet, Sir Seumas’s half-brother, Gilleasbuig, known as An Ciaran Mabach, also composed an elegy in memory of Sir Seumas. 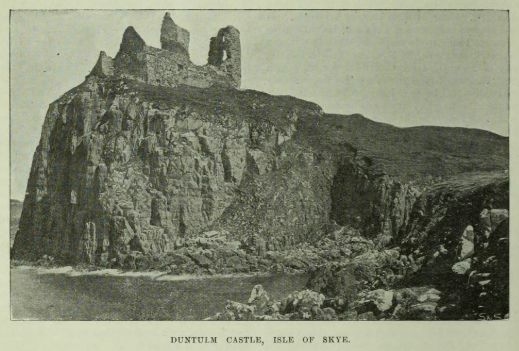 The ruins of Duntulm Castle, north Skye, one of the seats of the Macdonalds of Sleat in the seventeenth century. Image from ‘The Celtic Monthly’, 9 (1901), 56. Sir Ruairidh Mòr MacLeod (d. 1626) was a veteran of the Irish wars of the 1590s and habitually signed his name in Gaelic script, corra-litir. He was a patron of Gaelic arts and the subject of a number of praise poems and, uniquely, a set of household accounts survives from his time as chief which are written in Gaelic. Nothing is known about Sir Ruairidh’s own education (although holograph letters survive from him in Scots and he clearly had a Gaelic education too). He sent his sons, however, to the University of Glasgow in the 1620s and a number of clansmen followed them there throughout the remainder of the seventeenth century. 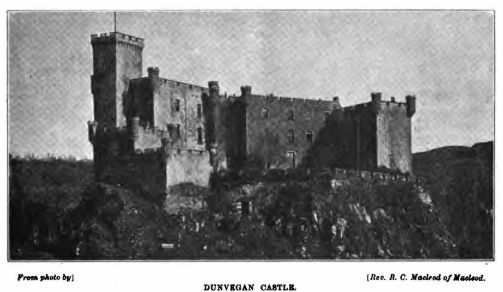 Dunvegan Castle, Skye, seat of the Clan Macleod. Image taken from Celtic Monthly, XI (1903), p. 145. 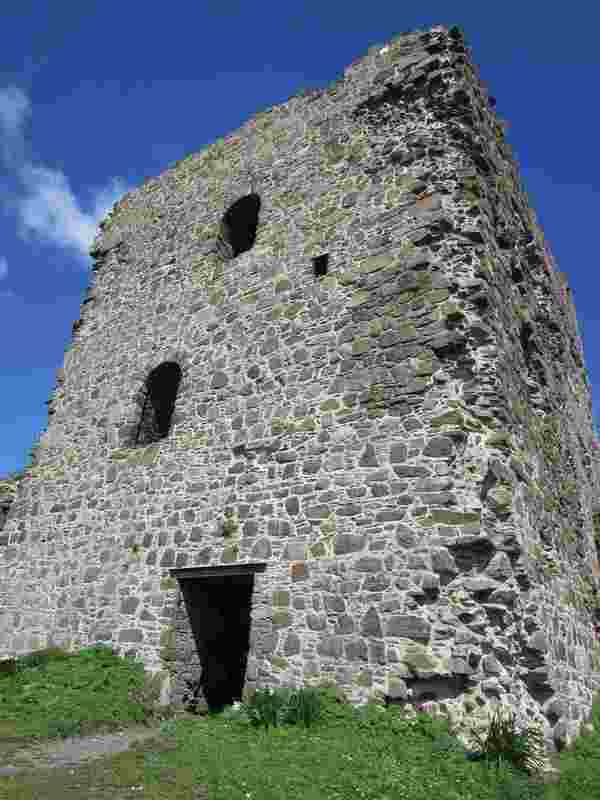 There were strong commercial links between Sir Ruairidh and Clan Macleod and the merchants of Glasgow in the first quarter of the twenteth century. Sir Ruairidh sent his sons, Iain Mòr, Uilleam and Tormod to the university and they were boarded out to some Glasgow burgesses during the 1620s while they attended University. Iain Mòr MacLeod, succeeded his father as clan chief in 1626. Iain Mòr gave a grant of £100 to the University of Glagow in 1630 as a contribution towards building the fabric of the college and the library. Members of the Clan Campbell had attended the University of Glasgow since around the time of its foundation, 1451. Gilleasbuig (or Archibald) Campbell, 8th Earl and Marquess of Argyll (1605-1661), also known as MacCailein Mòr, the chief of Clan Campbell. He himself had attended St Andrews University, 1621-23, but a reference to an ‘Archibaldus Lornus’ in the records of the University of Glasgow in 1630, might suggest that he later took a class there too. This evidence of Lord Lorne’s links with Glasgow in 1630 are inconclusive, but what can be said for sure is that in 1635 he gave a gift of 500 merks to the University to help with costs of building a new College and library. Image, left, of Gilleasbuig (Archibald) Campbell, 1598-1661, who was known variously (in English) as Lord Lorne, as the 8th Earl of Argyll and as the Marquis of Argyll. This painting by David Scougall is reproduced here by permission of the National Portrait Gallery of Scotland. ©Scottish National Portrait Gallery, PG 1408. Despite his engagement with the anglophone world the Marquess also ensured, around the same time, that his eldest son and heir, Gilleasbuig (the future 9th Earl) had been raised according to the customs of Gaelic society and fostered under the care of Sir Cailean Campbell of Glenorchy. He also made sure that young Gilleasbuig was given Gaelic instruction as part of his education while he was placed with his foster parents. The young Gilleasbuig was given a ‘Mr Johnne McLen’ as one of his Gaelic teachers, 1633-34, before he went to University. Niall or Neil Campbell, Lord Lorne’s (the Marquess of Argyll’s) second son was fostered with another kinsman, Sir Dòmhnall Campbell of Ardnamurchan. Both sons spent some time attending classes at the University of Glasgow. The signatures of young Gilleasbuig (‘Archibald’) and his brother Niall (‘Neill’) appear on the University matriculation rolls, 1642-43. (Images reproduced by kind permission of University of Glasgow Archive Services, University collection, GB0248 GUA 26619/204 & 310.) The signature of another clan chief, ‘Joannes Colquhoune, filius primogentis domini Lusse’ Iain Mac a’ Chombaich, mac Triath Luis) can be seen to the left of Gilleasbuig (Archibald) Campbell’s name. Young Gilleasbuig and Niall’s father, Gilleasbuig, the 8th Earl, or Marquess of Argyll, has had something of a grim reputation for the persistence with which he pushed the Covenanting cause against Charles I and pursued his many enemies during the civil wars of the 1640s. 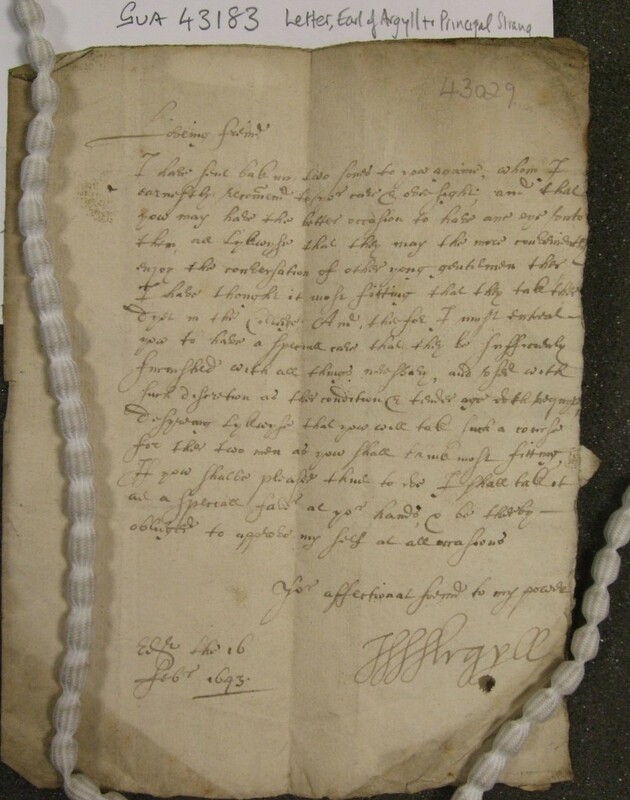 This following letter, however, shows a more human side, with him asking the Principal, John Strang, to take care of his sons while they returned to attend classes at the University of Glasgow in February 1643. Niall, the younger brother, continued to attend classes until 1646. I have sent bak my two sones to you againe, whom I earnestly recom[m]end to yor care & oversight and that you may have the better occasion to have ane eye unto them, as lykewyse that they may the more conveniently enjoy the conversation of other young gentlemen ther. I have thought it most fitting that they tak their dyet in the Colledge. And therfor I must entreat you to have a special care that they be sufficiently furnished with all things necessary and to see with such discretion as ther condition & tender age doth requyre. Desyreing lykewyse that yow will tak such a course for the two men as you shall think most fitting. If yow shal be pleased thus to us, I shall tak it as a speciall favor at yor hands & be therby obliged to approve myself at all occasions. The Marquess of Argyll had every right to worry about his sons. Principal Strang of Glasgow University, a fellow Covenanter, may have been a friend, but the Earl did not lack enemies both due to his inheritance as Campbell clan chief and for the vigour with which he pursued his Covenanting agenda against Charles I and his own clan’s interest often to the disadvantage of his neighbours. Gilleasbuig, the Marquess of Argyll, was executed at Edinburgh in 1661 after the Restoration by a vengeful Charles II. 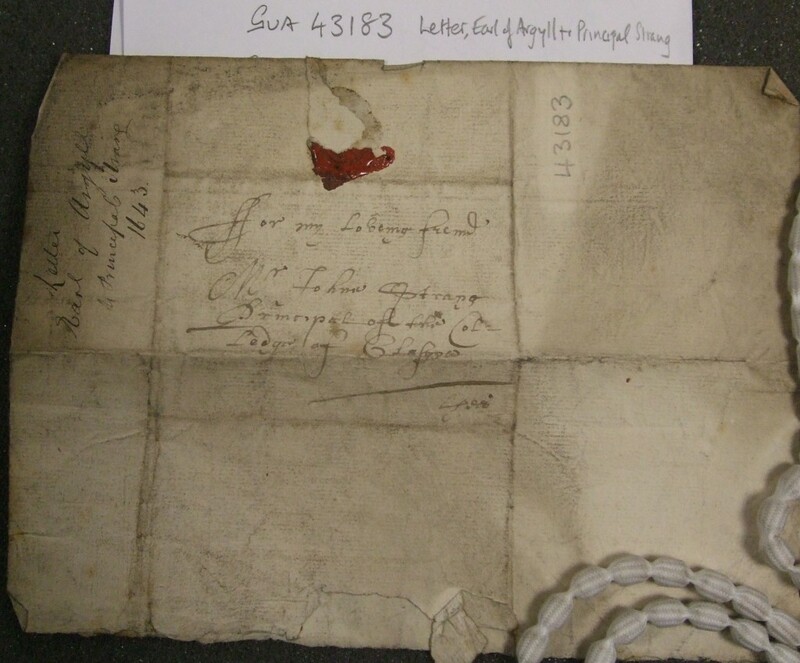 His son, Archibald, 9th Earl of Argyll (1629-1685), the subject of this letter, also later fell foul of Charles II and was executed after leading a botched rebellion against James VII in 1685. All chiefs of Clan Campbell are known as MacCailein Mòr, in memory of one of the first chiefs. However, each individual chief had Gaelic nicknames. The 7th Earl of Argyll (chief, c.1592-1618) was known, probably not to his face, as Gilleasbuig Gruamach (Gloomy Archie). This sobriquet may have been inherited by his son, also Gilleasbuig. Gilleasbuig, Lord Lorne who became 8th Earl and Marquis of Argyll (chief, 1625-1661), was given the nickname Gilleasbuig Caoch (Squinty eyed Archie), while young Gilleasbuig the future 9th Earl who attended the University of Glasgow in 1643 was known in Gaelic as Gilleasbuig Fionn (Fair-haired Archie). The survival of informal Gaelic by-names such as these for these Clan Campbell chiefs are an indication of their status as Gaels. [ 1 ] Inveraray Castle Archive [ICA], Argyll Transcripts [AT], xi, 73. C. Innes, ed., Muminentae Alme Universitatis Glasguensis [MAUG] (4 vols., Maitland Club, Glasgow, 1854), iii, 63, 81. R. I. Black, ‘A Gaelic contract of lease, c. 1603 x 1616,’ in, D. Sellar, ed., The Stair Society. Miscellany Two. By various authors (Stair Society, Edinburgh, 1984), 132-143, at140. R. Black, The Gaelic Manuscripts of Scotland. Vol. 1., Classical Gaelic, Irish and Welsh manuscripts in the National Library of Scotland (Unpublished draft catalogue), consulted in the National Library of Scotland. Thanks to Dr Ulrike Hogg, NLS, for her assistance. [ 2 ] National Records of Scotland [NRS], RD 1/305, fol. 108v. Niall is on record attending the University as 1620 under the name ‘Nigellus McKinnone’. MAUG, iii, 74. A. Nicolson, The History of Skye (2nd edition, Àrd Bhearnasdal, 1995), 80-81. [ 3 ] A. Nicolson, The History of Skye, 94. A. I. Mackenzie, ed., Òrain Iain Luim. Songs of John Macdonald bard of Keppoch (SGTS, Edinburgh, 1964), 102-106, 136-140, 277-9, 289-291. A long list of nobles and clerics from throughout Scotland who donated monies in the 1630s included Iain Macleod of Dunvegan (see below), Eachann Maclean, younger of Duart, Sir Coll Lamont of Innerin, Seumas Lamont of Innerin, Sir Dùbhghall Campbell of Achinbreck, Seòras Mackenzie, Earl of Seaforth, John Leslie, Bishop of the Isles (1631) and his successor as, Niall Campbell Bishop of the Isles, Mr Gilleasbuig MacLachlann, parson of Luss, Mr Gilleasbuig Cameron, parson of Inchcailleach. MAUG, iii, 468-478. [ 5 ] R.C. MacLeod, ed., The Book of Dunvegan, being documents from the Muniment Room of the Macleods of Macleod at Dunvegan Castle, Isle of Skye (2 vols., Third Spalding Club, Aberdeen, 1938-39), i, 217-8, 220, 222, 224, 225, 227. NRS, RD 1/292 fol. 70v. NRS, RD 1/292 fol. 71r. I.F. Grant, The Macleods, the history of a clan (London 1959), 240-242. [ 6 ] The amount on the receipt given by the University of Glasgow to Iain Mòr Macleod of Dunvegan, 16 July 1632 for was £100 Scots rather than 100 merks as stated by Alexander Nicolson (which would be around £66). Nicolson, The History of Skye, 75. Macleod, ed., The Book of Dunvegan, i, 224. [ 7 ] J.C. Watson, ed., Gaelic Songs of Mary Macleod (SGTS, Edinburgh, 1934). A. Frater, ‘Màiri Nighean Alasdair Ruaidh’, in J. Randall, ed., Crossing the Minch. Exploring the Links between Skye and the Outer Hebrides (Islands Book Trust, 2008), 33-43. P. Parkes, ‘Celtic fosterage: adoptive kinship and clientage in north west Europe’, in, Comparative Studies in Society and History, 48/2 (2006), 359-95, aig 385-7. [ 8 ] MAUG, iii, 18. ICA, AT, xi, 639. A. I. Macinnes, The British Confederate. Archibald Campbell, Marquess of Argyll, 1607-1661 (Edinburgh, 2011), 5. [ 9 ] D. Stevenson, Highland Warrior. Alasdair mac Colla and the Civil Wars (Saltire Society, Edinburgh, 1994), 154-163, 232-241. [ 10 ] Macinnes, The British Confederate, 1-43. [ 11 ] GUAS, GUA 43183. MAUG, iii, ix-x, xiv, 97, 101. Macinnes, The British Confederate, 66-67. D. Gregory , ed., Collectanea de Rebus Albanacis (Iona Club, Edinburgh, 1847), 19-20. C. Innes, ed., The Black Book of Taymouth, with other papers from the Breadalbane charter room (Bannatyne Club, Edinburgh, 1855), xvii-xxiii, 94. R. Black, ‘A Scottish grammatical tract, c. 1640,’ in, P. de Brún & M. Ó Murchú, eds., Celtica, vol. XXI. Essays in honour of Brian Ó Cuív (1990), 3- 16, at 6-7. [ 12 ] Macinnes, The British Confederate, 277-280, 283, 294-306. Gilleasbuig Campbell, the Marquess of Argyll was beheaded in 1661 following the Restoration of Charles II. The Marquis of Argyll’s son, Gilleasbuig, Lord Lorne, followed him as clan chief and became the 9th Earl of Argyll. The 9th Earl was beheaded in 1685, like his father before him, due to his involvement in national politics. 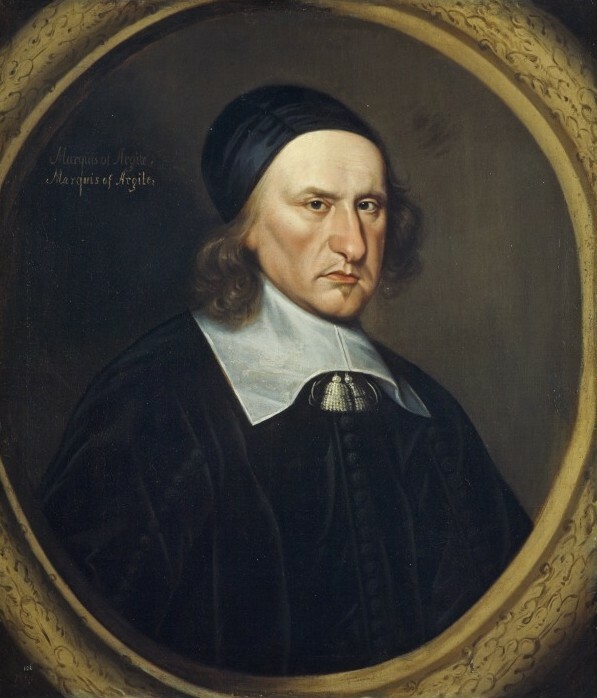 See, David Stevenson, ‘Campbell, Archibald, marquess of Argyll (1605×7–1661)’ & ‘Campbell, Archibald, ninth earl of Argyll (1629–1685)’, in the Oxford Dictionary of National Biography, articles 4472 & 4473, accessed Dec 2013]. [ 13 ] C. Ó Baoill & M. Bateman, ed. & transl., Gàir nan Clàrsach. The Harps’ Cry. An Anthology of 17th century Gaelic poetry (Birlinn, Edinburgh, 1994), 10, 14, 16. Macinnes, The British Confederate, 31, 53, 57.